The Lees Transitway station will be partially closed in December to accommodate LRT construction. City staff presented details on the bus route adjustments at a recent community meeting. Read the presentation for details. As part of this work, a new turnaround location for the #85 bus is required, and several options were presented. The current plan is to use the Lees campus parking lot turnaround (Option 1). The ramp currently under construction outside Old Town Hall is scheduled to be completed the second week of December 2015. The ramp will help to ensure that Old Town Hall is more accessible. 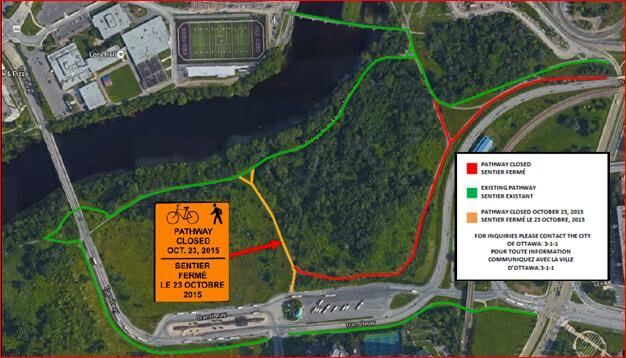 Please be advised, in order to continue construction on the new Hurdman Station Guideway, the Multi-use pathways in the area will be on the following detour starting October 23, 2015. The annual Brantwood Fall Clean-up is scheduled for Saturday, October 17, between 10:00 am and 12:00 pm. All are welcome and the meeting point will be at the Brantwood Field House. Bags and gloves will be provided. Due to construction of the LRT, the Rideau River Transitway Bridge will be closing on December 20, 2015. The Transitway between Hurdman Station and Lees Station will also be closing. During the closure, buses, pedestrians and cyclists will be detoured. City staff have advised that sidewalk and pathway access will be detoured accordingly throughout the duration of the project, and signage and advance notice will be provided indicating all available detour options.